Mysuru: There is an aphorism in journalism — “When a dog bites a man, it is not news, but if a man bites a dog it is news.” Rarely do we hear a man biting a dog. But on Sunday last (June 25), it was not a man biting a dog, but something more blood-curdling and inhumane that occurred as a group of men tried to kill a helpless animal. This gory incident occurred at N.R. Mohalla, when a man and his friends took the extreme step of attacking a dog with a meat cleaver and threatened the inmates of the house with knives when they tried to intervene. This is all that happened: Arokya Mary, a resident of N.R. Mohalla, AJ-Block, 7th Cross, has a pet dog called Jimmy. As she lives alone, she has kept Jimmy, which was born in her house and is looking after it lovingly since the past 12 to 13 years. Arokya Mary’s daughter Aasia Banu, who lives close by, came with her two children to her mother’s house around 5.30 pm. Jimmy saw Aasia and her children from a distance and squeezing himself through the gate, came running towards them wagging his tail. He started jumping all over, licking and welcoming them. Meantime, a speeding man, Zullu, on the bike suddenly came in the way. The dog, out of fear, started barking at him. Zullu got very angry and started abusing Aasia in foul language. Fearing assault, as he went to collect huge stones lying nearby and threw it into the compound, Aasia immediately took Jimmy and tied him on the terrace and after spending time with her mother left to her house along with her children. “I and my mother asked him for forgiveness. We told him that in future we will not allow the dog on the road,” she told Star of Mysore. Within an hour, Zullu came with two other people, barged into the house and walked up to the stairs and started attacking Jimmy that was tied, with meat cleaver. He plunged the cleaver into the head, neck and the jaws of the dog. “When my mother heard the dog crying, she went upstairs and both Zullu and his friends pointing knives, threatened to kill her. Later, they escaped,” said Aasia. If the dog was not tied, then it could at least have escaped the attack. Because of the attack, the gash on the head was too deep and it started bleeding profusely. Immediately, Arokya Mary called her daughter who rushed back. “As it was a Sunday, we knew that the Veterinary Hospital was closed. We searched in the internet and found “The Woof Wagon Veterinary Clinic and Pet Resort” in Dattagalli. 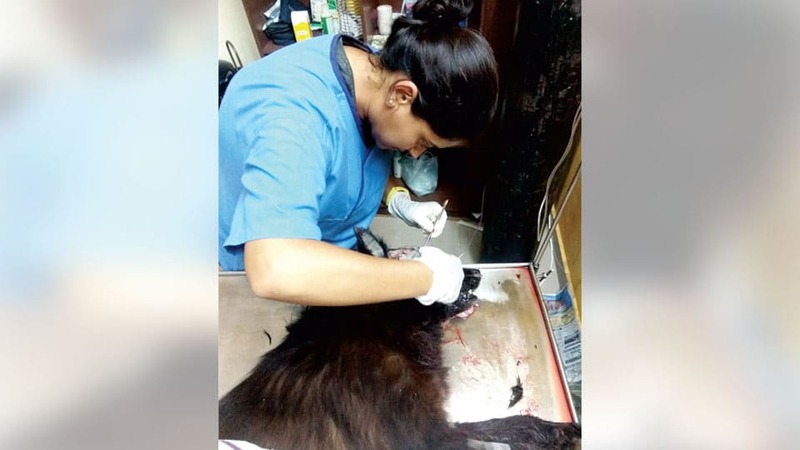 We took Jimmy to the Clinic and the doctors Dr. Suranjana Ganguly and Dr. Shantanu Kalambi treated him,” she said. According to the doctors, the dog is still in an unstable condition, and will undergo treatment until it recovers. Meanwhile, Arokya Mary has filed a complaint in the N.R. Police Station stating that not only did Zullu attack the dog but also threatened to kill her. Police, who registered a complaint, have assured that they would question the accused. N.R. 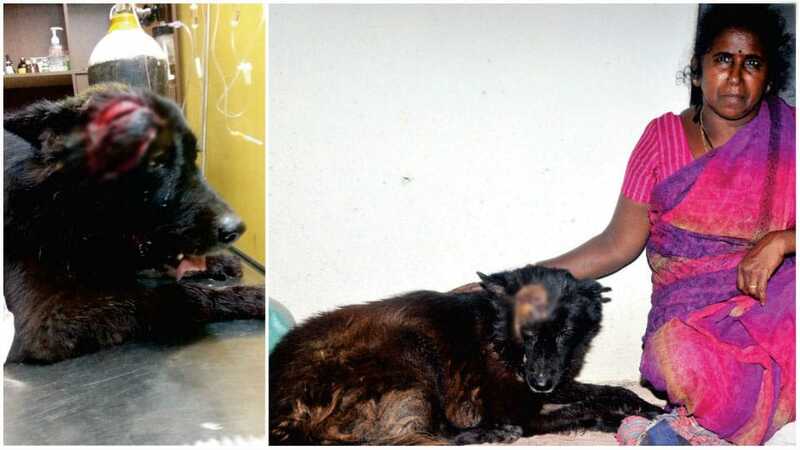 Police Inspector Ashok Kumar told Star of Mysore that Arokya Mary had filed a complaint stating that her pet dog had been brutally attacked leaving it injured on the head, neck and jaws and the accused had also threatened to kill her. “We went to the house and conducted mahazar, took the photos of the dog and will take action against the accused,” he said. Bengaluru enters Smart City list… How and why Mysuru lost the contest to be a Smart City? I hope this “Zullu” and his accomplices gets severe punishment for deliberate cruelty to an animal and home invasion. The action by these thugs shows that they are not afraid of the law. I consider the reaction of the police, puzzling. Instead of immediately arresting the perpetrators, they are going to investigate! Is it any wonder that thugs don’t fear the police.